Our next Science and Religion lecture at Hampshire College is tomorrow (April 12th) by Margaret Race. 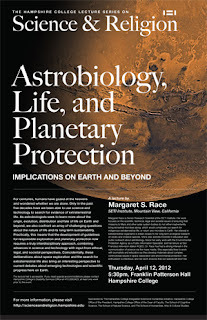 She will be talking about Astrobiology, Life, and Planetary Protection. Join us at the talk if you are in the area. For centuries, humans have gazed at the heavens and wondered whether we are alone. Only in the past 5 decades have we been able to use science and technology to search for evidence of extraterrestrial life. 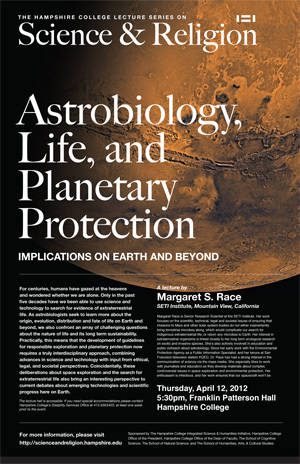 As astrobiologists seek to learn more about the origin, evolution, distribution and fate of life on Earth and beyond, we also confront an array of challenging questions about the nature of life and its long term sustainability. Practically, this means that the development of guidelines for responsible exploration and planetary protection now requires a truly interdisciplinary approach, combining advances in science and technology with input from ethical, legal, and societal perspectives. Coincidentally, these deliberations about space exploration and the search for ET life also bring an interesting perspective to current debates about emerging technologies and scientific progress here on Earth. Margaret Race is Senior Research Scientist at the SETI Institute. http://www.seti.org/ Her work focuses on the scientific, technical, legal and societal issues of ensuring that missions to Mars and other solar system bodies do not either inadvertently bring terrestrial microbes along, which would complicate our search for indigenous extraterrestrial life, or return any microbes to Earth. Her interest in extraterrestrial organisms is linked closely to her long term ecological research on exotic and invasive species. She is also actively involved in education and public outreach about astrobiology. Since her early work with the Environmental Protection Agency as a Public Information Specialist, and her tenure at San Francisco television station KQED, Dr. Race has had a strong interest in the communication of science via the mass media. She especially likes to work with journalists and educators as they develop materials about complex, controversial issues in space exploration and environmental protection. Her enthusiasm is infectious, and her work ensures that our spacecraft won't be. Definitely something I would like to read. Rosetta Stone back to Egypt? Does the Arab world (not) need basic science? A Film Autopsy of "The Hunger Games"
Saturday Video: Where are the aliens? 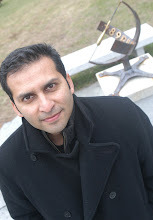 A Film Autopsy of the Iranian film "A Separation"